The antiquity of Cyclocarya paliurus (Juglandaceae) provides new insights into the evolution of relict plants in subtropical China since the late Early Miocene. Posted in News, Publications | Comments Off on The antiquity of Cyclocarya paliurus (Juglandaceae) provides new insights into the evolution of relict plants in subtropical China since the late Early Miocene. 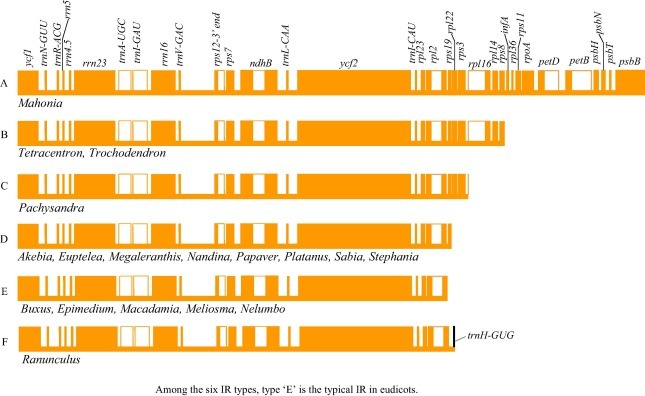 Comparison of gene content in IR among 18 early-diverging eudicot plastomes. From Sun et al. 2016. Figure 1: Flowers of Magnolia champaca (Magnoliaceae) showing the spiral arrangement of floral organs typical of many basal angiosperm lineages. : Wang et al.7 provide new insights into the transition from the spiral to whorled arrangement of floral organs. Photograph courtesy of Walter Judd. Angiosperm evolution involves a major transition from spiral to whorled arrangements of floral organs. Examination of the genetic programs specifying floral organ identity in Nigella damascene, a species of Ranunculaceae with spiral flowers, illuminates the molecular basis of how spiral flowers can have flexible numbers of floral organs. (a) Geographical distribution of the sampled populations and six clades; (b) the median-joining network of the 18 chloroplast haplotypes of Cyclocarya paliurus. Circle sizes are proportional to the haplotype frequencies. Black dots indicate hypothetical haplotypes. Solid bars indicate the number of mutational steps. See Kou et al. 2016 for details.